I will be doing your Hollyhock workshop at Ellen’s on the 21st November. Can you please tell me what we need for it and will it be possible to trace it off at home as I am rather slow. Looking forward very much to seeing you again. Hello Val nice to hear from you. I dropped all the info and paintings etc at Ellenvale Cottage last Tuesday. Can you get to Ellenvale Cottage before the workshop to pick up all the infomation and pattern? if you can’t, maybe they will post it to you. Looking forward to seeing you again. Thank you Carol for another lovely day of Painting at Ellenvale Cottage. I will think of you over Christmas time Sending you my best wishes. 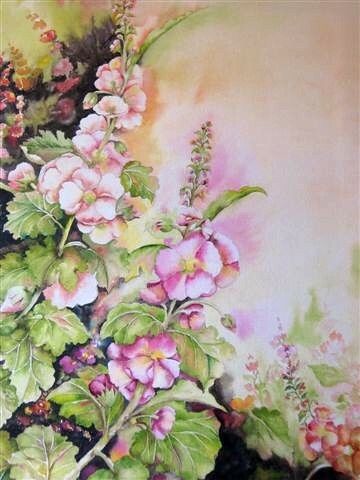 Loved the latest Hollyhock workshop Carol, thanks again for coming to Ellenvale Cottage we all really enjoy the days that you are there. Love the dolphins, look forward to that workshop too. person’s web site link on your page at suitable place and other person will also do same for you.